The APCO Double-Acting Throttling Device (DAT) is designed to regulate and restrict air venting on the discharge orifice of air valves. The DAT features an exclusive throttling air-out/full flow air-in design. On pump start, the device establishes a pressure load on the rising column of water to eliminate shock to the pump, controls and check valve. On pump stop, the DAT device automatically opens to allow full line, unrestricted air reentry to prevent a vacuum and water column separation in the pump. The DAT is not a stand-alone device and cannot be installed directly to the pipeline. 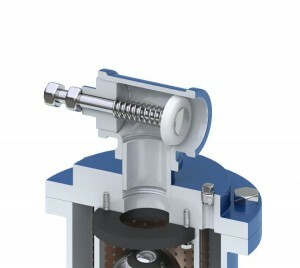 The DAT must be installed in the outlet port (top) of the Air/Vacuum Valve or Combination Air Valve.